The director, writer, and star of “Terror of Frankenstein” detail the grisly behind-the-scenes crimes that claimed the lives of the film’s cast. Victor Frankenstein stumbles alone through the frozen tundra of the Arctic Circle until he is rescued and brought aboard a ship commanded by Captain Walton. Victor eventually recovers and begins recounting his story after Walton mentions having seen a giant traveling on the ice aboard a sled pulled by dogs. DIRECTOR’S COMMENTARY: Director Gavin Merrill and screenwriter David Falks introduce their audio track for the 37th anniversary edition of “Terror of Frankenstein.” The duo explains their usage of the pseudonyms Calvin and Yvonne Floyd as a reference to their production company troupe Theater 4-1. As they open on a discussion of getting actor Leon Vitali to join their cast, Gavin and David begin hinting at a recent criminal trial behind-the-scenes regarding horrible tragedies that befell the cast. Years earlier, Victor leaves behind his family, his fiancée Elizabeth, and his friend Henry Clerval in Geneva, Switzerland to pursue his interests in science and alchemy at the university in Ingolstadt, Germany. Studying under Professor Waldheim, Victor experiments on animals in an effort to discover the secret of life, but eventually moves on to clandestinely using dead human bodies in his research. DIRECTOR’S COMMENTARY: Scenes with the actress Isabelle (Stacy Dorning), who was convinced to play Elizabeth by fellow actor Nicholas Clay, start making David uncomfortable. David mentions that Leon Vitali ruined David’s life with his testimony. He adds that Leon stole Izzy away from Nicholas. David and Gavin also mention the suitcase carried by Vitali in the scene where Victor leaves for Ingolstadt, and begin pointing out the prop every time it appears onscreen. Gavin and David reveal that the actor who played Waldheim, Danville (Archie O’Sullivan), was a homosexual alcoholic with a proclivity for boy prostitutes. Danville was murdered by decapitation. After rebuilding a cadaver, Victor uses a kite to harness the electricity from a lightning storm and bring his creation to life. Astonished when he actually succeeds, Victor becomes horrified by his monster. DIRECTOR’S COMMENTARY: David cryptically refers to an intense preparation “method” used to get actors into character, including slaughtering live animals and having cast members live on an immersion set. Gavin mentions that he isn’t sure how the actors who played the coroner or the carpenter died. The monster disappears. Victor tells no one of his creation and returns home to Geneva with Henry to recover while on holiday. The monster follows its creator and kills Victor’s younger brother William. DIRECTOR’S COMMENTARY: David is distressed when he sees actor Nicholas Clay. It is insinuated that the child actor who played William was involved with Danville and became a serial killer. He later burned to death while freebasing. Gavin indicates that Leon is supposed to join the commentary recording, but he is late in arriving at the studio. Victor confronts the monster after discovering that it murdered William and learns that his creation has vowed to destroy him. The monster explains that he desired a friend to comfort his loneliness, but rage drove him to kill William upon realizing that the boy was repulsed by his ugly appearance. It also satisfied the monster to make Victor suffer. DIRECTOR’S COMMENTARY: Actor Per Oscarsson spent five weeks on the immersion set living as the monster. Izzy and Nicholas wore masks made from dead animals and insisted on being called Sturgeon and Boarface. Per asked Nicholas to urinate in his food bucket and would be woken in the middle of the night by an electric cattle prod. The monster recounts experiences from his journey to Geneva, including the discovery of Victor’s notes, encountering a blind man and his family, and running afoul of frightened villagers. He then demands that Victor create a female companion for him under threat of murdering the entire Frankenstein family. Victor relents after the monster promise to live in isolation. Henry sees Victor off when he leaves to continue his experiments on a remote island. Upon discovering that the monster followed him and killed two local villagers, Victor ultimately decides to abort his work, thus angering the monster. DIRECTOR’S COMMENTARY: After filming the cave scene, Per Oscarsson disappeared. When he resurfaced later, Izzy found him bearded and disheveled in a hole on the immersion set. To get Per back into form, David tasked Nicholas with doing something unspecified with the “method” that ultimately worked. However, Per was institutionalized after the film wrapped. Nick later skinned Per and cut out his tongue inside Per’s padded room before orderlies could stop him. Victor returns home just as the monster makes good on his threat by throwing Henry off a cliff. Despite his desire to postpone their wedding due to fear of the monster’s retaliation, Victor and Elizabeth are married. That night, the monster sneaks into the Frankenstein home and strangles Elizabeth. DIRECTOR’S COMMENTARY: Leon Vitali finally arrives at the recording studio. He immediately begins needling David with his unflattering “Igor” nickname. Victor’s father does not believe Victor’s tale of creating a monster that murdered his wife. On his own, Victor begins a relentless pursuit of the monster that ultimately leads him to the Arctic. DIRECTOR’S COMMENTARY: The trio discusses the extreme method techniques that tortured Per. Leon reveals that David’s method cracked Nicholas while trying to get Per back into character. Victor thus concludes his story for Captain Walton. Based on Victor’s warning about blind determination, Walton decides not to continue his dangerous journey to the North Pole, but the ship becomes disabled and the monster strikes. The crew abandons ship, leaving Victor alone to have a heart attack upon confronting his creation. Walton returns to the cabin and tries attacking the monster after hearing his words, but the monster escapes across the snow outside. DIRECTOR’S COMMENTARY: Leon reveals that Nicholas’ first crime was decapitating Danville, hiding the head in the suitcase prop, and routinely using it to keep Per on edge. When David admits that Per told him about the head in the suitcase, Gavin is shocked to learn that David knew about the incident, yet said nothing that could have prevented the other murders. Leon and Gavin walk out of the recording booth while David weeps. As director and producer respectively, Rodney Ascher and Tim Kirk have made noteworthy waves by blending reality with fantasy in the documentaries “Room 237” (review here) and “The Nightmare” (review here). Both projects identify the filmmakers’ fascination for applying fictional veneers to nonfiction narratives as a uniquely informative entertainment form. Swapping director and producer hats on their third feature collaboration, “Director’s Commentary: Terror of Frankenstein” finds Kirk and Ascher evolving their hybrid storytelling techniques into a fake audio track for a real movie, only to achieve an end result that isn’t as fulfilling as it could or should be. “Director’s Commentary: Terror of Frankenstein” is such an obvious extension of the “Mystery Science Theater 3000” mindset that it is confounding this format is not already routinely employed. A key difference is that MST3K has the advantage of striking into already rich source material be mining hilarity inherent in the B-movies lampooned. While not a straight parody of the film being framed, “Director’s Commentary: Terror of Frankenstein” instead starts with a neutered nucleus that puts the kooky concept behind the eight ball from the first break. 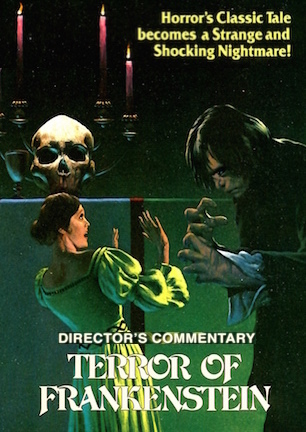 “Terror of Frankenstein” (review here) is a faithful, yet mostly forgotten 1977 film adaptation of the Mary Shelley classic. Remarkable for being unremarkable, the movie doesn’t have the Styrofoam sets and C-list celebrities that might make mockery come easily. Without cleverly campy charm in its corner, the visuals here are more or less reduced to mere accompaniment for the dialogue. So “Director’s Commentary” goes for a different style of spoof that is not intended to be strictly comedic. Changing the names of the living while making fair game of the dead, the faux commentary track abandons the usual behind-the-scenes chatter to fabricate an exposé on the macabre murder spree that claimed the lives of the film’s core cast. “Director’s Commentary” earns early snickers by opening on a DVD menu for the film’s oddly-commemorated 37th Anniversary Edition, complete with an unskippable FBI warning and a quickly aborted look at a slideshow extra. Clu Gulager voices director Gavin Merrill while Zack Norman plays writer David Falks, who explain that the movie’s actual credits of Calvin and Yvonne Floyd were a longstanding in-joke between the duo. The story laid on top of “Terror of Frankenstein” is basically a backwards-unfolding mystery dropping breadcrumbs about how each actor died before confirming the killer’s identity and resolving the fallout from the revelation. On paper, the premise sounds promising. In actuality, the execution underwhelms. The mild mystery element is conspicuously vague. It is mentioned at the outset that there was a recent trial and an execution, but the script goes out of its way to dance around details as Gavin and David cryptically reference various crimes in an unnatural manner. An equivalent would be discussing Sharon Tate’s murder without ever mentioning Charles Manson or his “family.” The final payoff to the frustration of waiting for the puzzle to piece together doesn’t pack the punch of a satisfying reward. Clu Gulager sounds like he is eating up the role of a delusional director, reveling in being the mouthpiece for juicy gossip about underage prostitutes and grisly decapitations, all with an authentic air befitting a DVD commentary. Partnered with Zack Norman on the other hand, the pair’s interactions never gel due to the clearly rehearsed cadence. Norman’s radio voice sounds great tonally, save for an ear-piercingly annoying bout of forced weeping during the climax, but his melodramatic delivery is a dead giveaway that this is a script reading and not an organic conversation. Of the screenings I attended at the 2015 Stanley Film Festival where it premiered, “Director’s Commentary: Terror of Frankenstein” was the only one where audience applause, even as a courtesy to the filmmakers in attendance, did not accompany the end credits. I don’t attribute that to dislike for the film necessarily. It felt owed more to confusion over how to react to the lukewarm weirdness just witnessed, which is quite possibly the most appropriate response. “Director’s Commentary” is a concept worth supporting provided it has a better frame and secondary story to go along with it. As far as its application to “Terror of Frankenstein” goes, Tim Kirk and Rodney Ascher deserve points for fusing irreverent pastiche with an original horror story that theoretically should be fun for genre fans. But this particular experiment in creative entertainment is more failure than success. May 7, 2015 by Ian Sedensky.